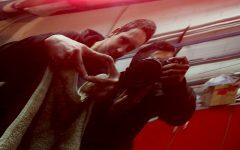 Game changer, epic, next level, show stopper – all fairly cliché words these that are carelessly thrown around these days but aren’t uttered too often around the Slam’d Staff editorial meetings. 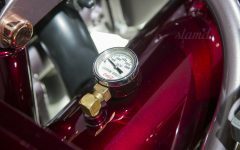 Our job AND our passion is diligently scouring the globe for the finest customs built around the globe, no matter the genre, so we definitely don’t use these words lightly. 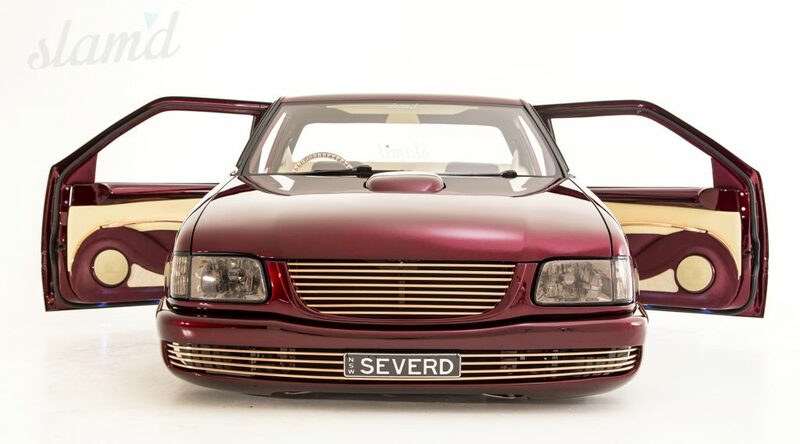 But for Michael “Bobbin” Ellard’s 1992 Holden Rodeo (similar to Isuzu Pup for those of you in the states) all of these adjectives combined still can’t accurately describe the quality and detail that went into this labor of love. 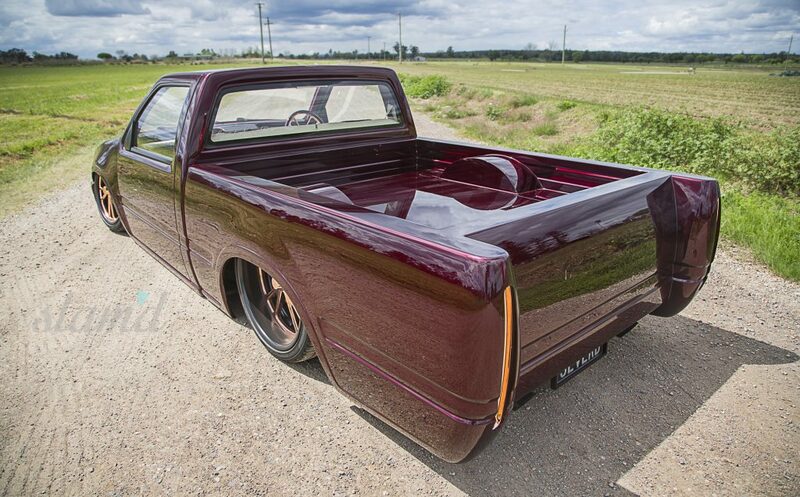 When it comes to truly notable builds, this Australian-built Rodeo dubbed “Severed Ruby,” is easily in the top five minitruck builds of all time. Follow along as we provide you exclusive insight into one of the baddest minitrucks ever built with our largest Slam’d feature to date – including build photos and a video feature! The journey of this mini started nearly a decade ago. 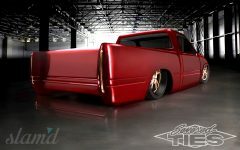 It resembled the overall same style with the Cadillac taillights and drag pan. The color was completely different and it wasn’t nearly as detailed. 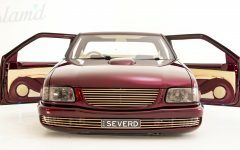 Sporting a bright orange paint job with clean smooth bodywork, the build was definitely ahead of its time, especially for the Australian custom truck scene. Back then, Michael did what any man would do for his family and sold his prized possession to purchase a home. When the opportunity came about to repurchase this build three years later Bobbin wasted no time in shelling out the necessary Australian dollar to re-cop his lost gem. There was one catch – the truck had been wrecked. 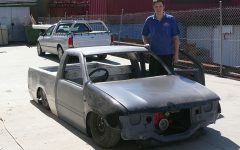 As you can see, this couldn’t stop a man on a mission and the goal was to restore the truck and go above and beyond. At Slam’d, we like to think that things in life tend to happen for a reason and this being the case, that wreck was the best thing that could of happened for the future greatness of this build. 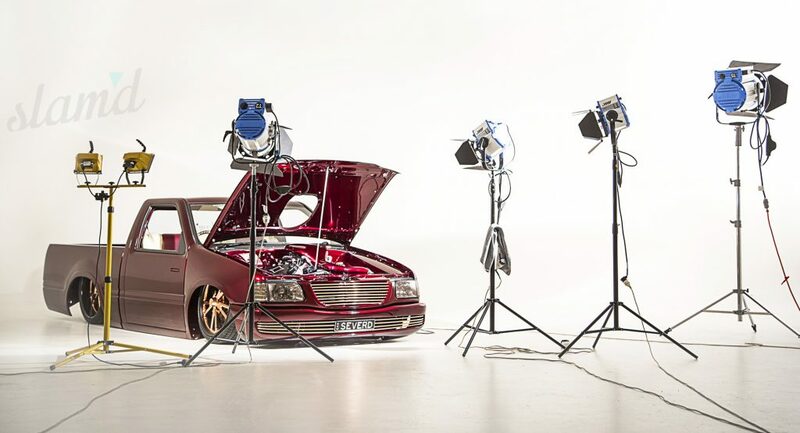 Having built various show vehicles and working for the family business at Image Limousines, Bobbin has certainly grown up around top notch quality builds. During the rebuild Michael met Laurie Starling from The Chop Shop and became good mates with him. Laurie helped kick the rebuild into gear and spent many a night scheming up outlandish and wild ideas to push the envelope even further. This is why the tragic loss of Laurie was heavy on Bobbin’s mind, so Michael and his brother Matthew decided to stomp the pedal to the metal and set their sights on debuting at the next Motorex show where Laurie was previously a guest Judge. This would be the perfect way for Bobbin and family to pay homage to a man that we all looked up to who was taken far too early. 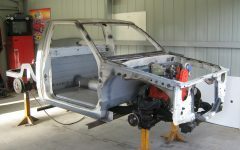 The truck was rebuilt from the ground up beginning with the suspension. Slam Specialties RE6 bags were utilized up front along with drop spindles and Chop Shop upper control arms. In the rear they used a Chop Shop cantilever 4-link combined with Slam RE7 bags. The chassis was shortened about 10-inches and a c-notch was done to provide the travel the Borg Warner differential needed. 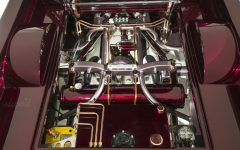 Copper hardline was used throughout as the new copper theme was perfect to plumb the air suspension in style. 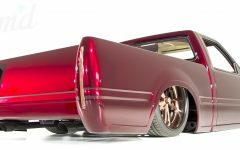 For rolling stock the perfect staggered set of copper-plated Intro Retro wheels and CTR Skyline Brembo brakes go to show how the customizers get around the super strict vehicle modification laws in Australia; including OE brakes that have passed “proper engineering” inspections. Bobbin went the extra length to ensure that his truck would pass all inspections so it could be legally driven. Body mods are at the core of any well-built custom and to say that Bobbin’s Rodeo has been heavily modded is a serious understatement. So much so, that it’s impossible to even list all of the body modifications that went into the metal surgery of this build. 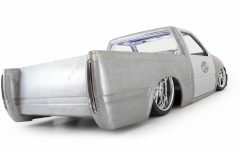 Up front, a 1960s Cadillac front bar was molded into the Rodeo bumper. 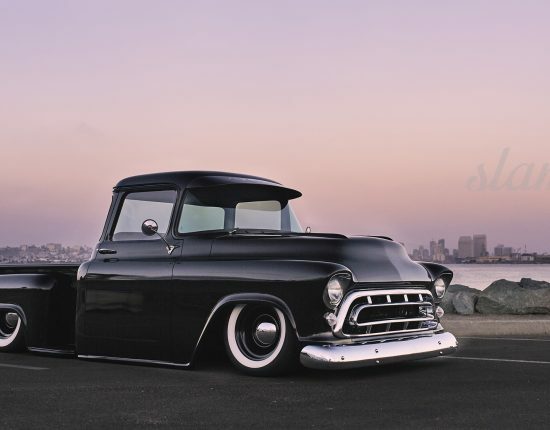 Out back, one of the first things you notice is the tailgate has been recessed towards the cab to give the truck a look of the glorious tail fin era. 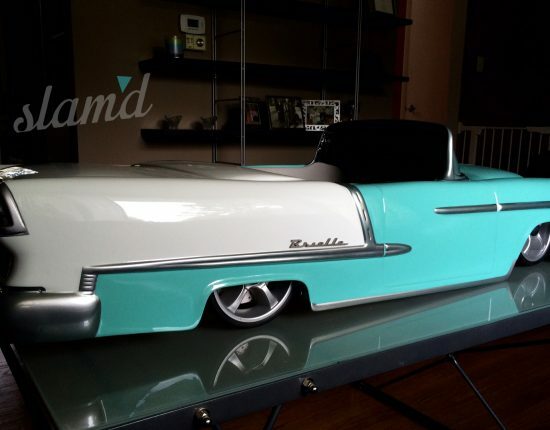 Since Cadillac is the king of tail fins Bobbin utilized Cadillac taillights on each side of the bed. The list of shaved items includes the tailgate, door handles, blinkers, wiper jets, and of course the factory taillights. 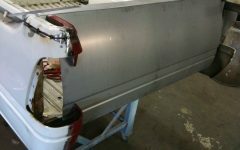 The custom door handles are nothing short of spectacular – since the doors have been suicided he opted for the smooth handles to be moved to the front of the doors. To ensure that no stone was left unturned a 2-inch chop was on the list and it was done so well that some never even notice it unless it’s pointed out. The bedsides were also shaved and include custom body lines inside the bed or “tray” as they call it down under. The license plate pops out from underneath the truck to provide that clean show truck appearance when on display at events. 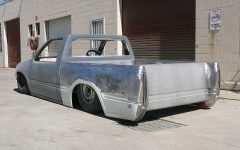 The hood was cut out for the shaker air intake and the firewall is totally shaved all the way through including underneath the cab and the bed. That signature House of Kolor Candy Brandywine paint really rounds out this build; mixed perfectly with copper plating accents on the wheels, grille, door strikers, interior pieces, etc. Talk about no comprises as it relates to waxing the show circuit inside and out! 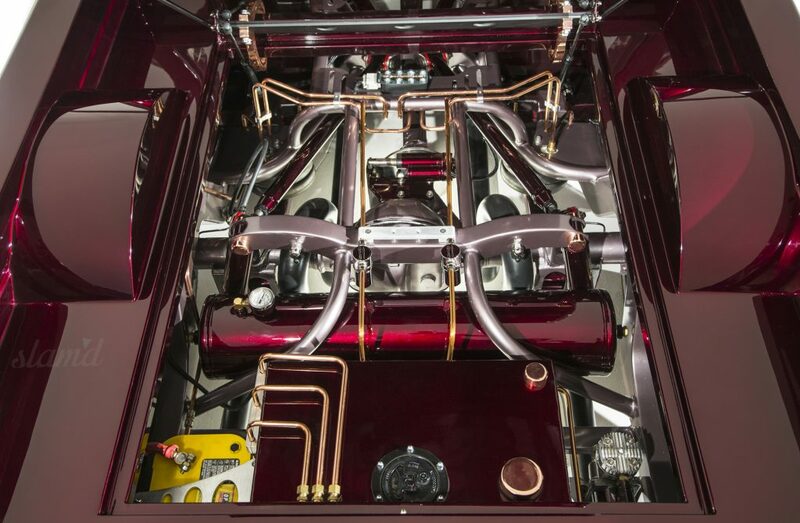 One of the coolest things about this entire painstakingly detailed build, is the fact that it was built to be driven to the limits. The heartbeat is a 5.7 LS1 V-8, which allowed Bobbin and the crew to focus on making it look pretty verse major internal work since this beast was more than enough for the Pup. 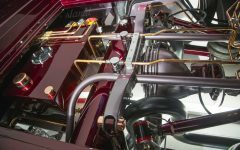 The intake is a custom intake with Edelbrock high-rise manifold. ClubSport extractors with 2-inch pipe mufflers were tied in to the catalytic convertors and run to the rear of the truck. As with the rest of this build, the engine bay detail is unreal. 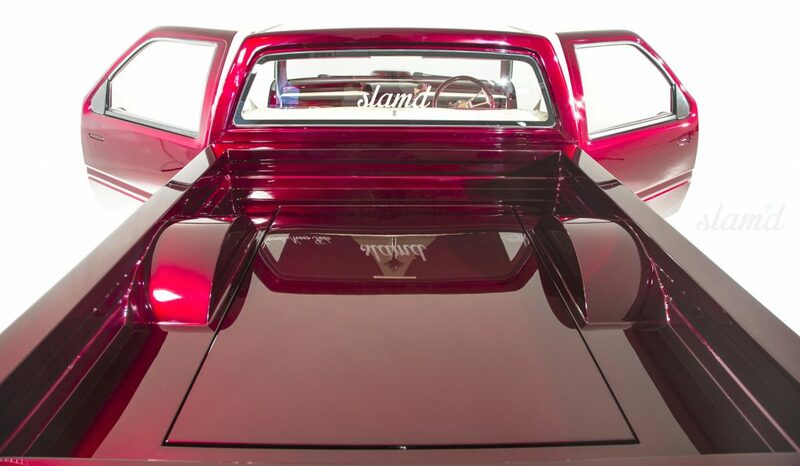 Custom parts galore including the full custom intake and air cleaner cover, custom flushed fluid fills into the wiper cowl, hidden wiring, and custom touches throughout. 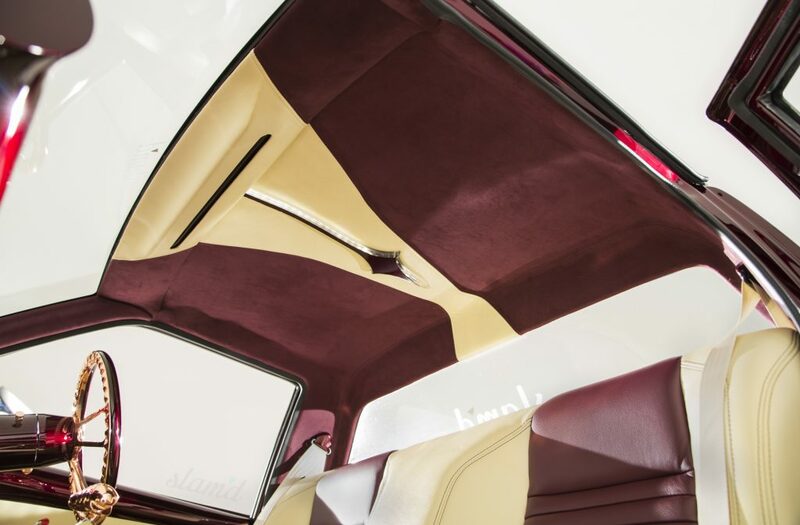 No true show truck that is built to this level is fully complete without a truly custom interior. 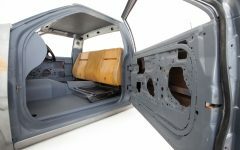 Holden Rodeo bench seats with R31 Skyline padding were molded in to give a totally different look to the normal routine bucket seats and back cab walls of these pickups. Hy-Tone Motor Trimming performed the work, which is done in brandy and cream leather for true elegance. 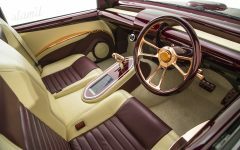 The smooth sheet metal dash is a piece of minitruck history as it came from Laurie Starling’s original minitruck build, “CHOPPA.” The copper theme is continued into the cab with the custom armrests, custom trim pieces, steering wheel, and other accents have all been copper plated. Upon further inspection into the cabin, you’ll obviously notice that it’s right-hand drive, but you may not notice the gauges on the super sleek custom dash. 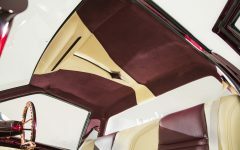 That’s because a set of Dakota Digital gauges are mounted above in the custom-built headliner pod. 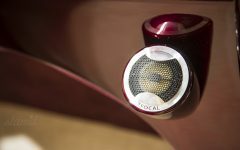 In Car Audio performed the install of the audio equipment including the Focal 10-inch sub along with Focal separates and amps. The icing on the cake for this entire build is the smooth interior completely free of switches or buttons. 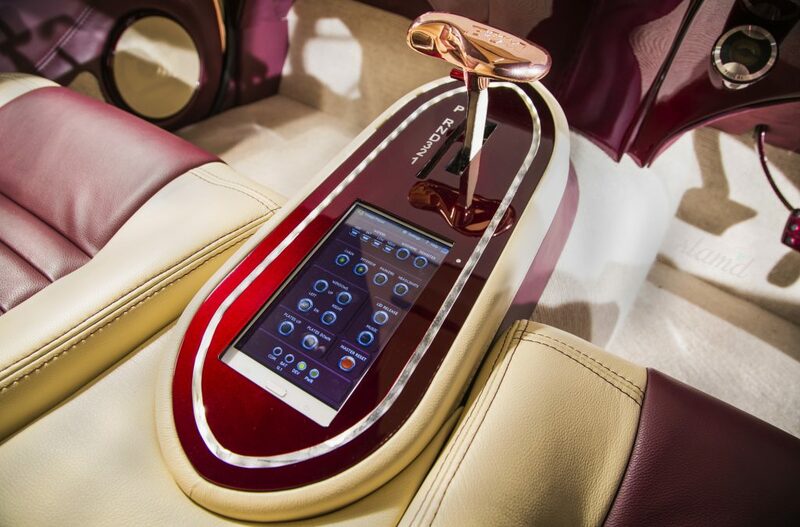 You see, Bobbin custom built a tablet touch control system that’s completely integrated into the truck. Yes, a touch control system that controls everything from the electric windows to starting the truck all via a Samsung Galaxy Tablet. This undertaking of building quite possibly the baddest mini the world over could not have happened without the talented efforts of many of Michael’s family and friends. He wanted to make sure to give a huge thanks to everyone involved, but a very special thanks to Laurie Starling from the Chop Shop for the inspiration and push to take this build to the next level. Thanks to Matt, Dad, Paul, Ricky, Steve, Skippy, Johnny and everyone that helped out the last six months of the build to see it finished. Also Image Limousines, Chop Shop, In Car Audio, Mobility Engineering, Glass Benders and House of Kolor for their support. And last but not least all the Severed Ties club brothers and sisters and Toasty, Mark, and Mike for putting this special Slam’d shoot together and making all of this happen in record time. 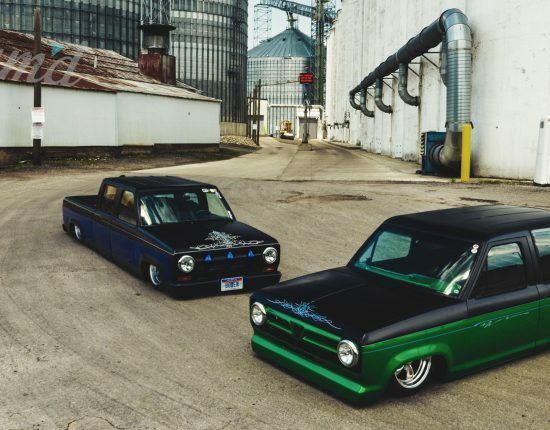 When asked if he would change anything about the build, Michael surprisingly said that he wished he had made the truck into a wagon that resembled a Chevy Nomad. Interesting; maybe the saying that a minitruck is never truly finished will ring true on a Severed Ruby Wagon reincarnation? Regardless, we know Laurie is smiling down on the out of this world creation that Michael and friends brought to life in his memory.